The Narrows Cottage has two bedrooms, one bath, waterfront location. 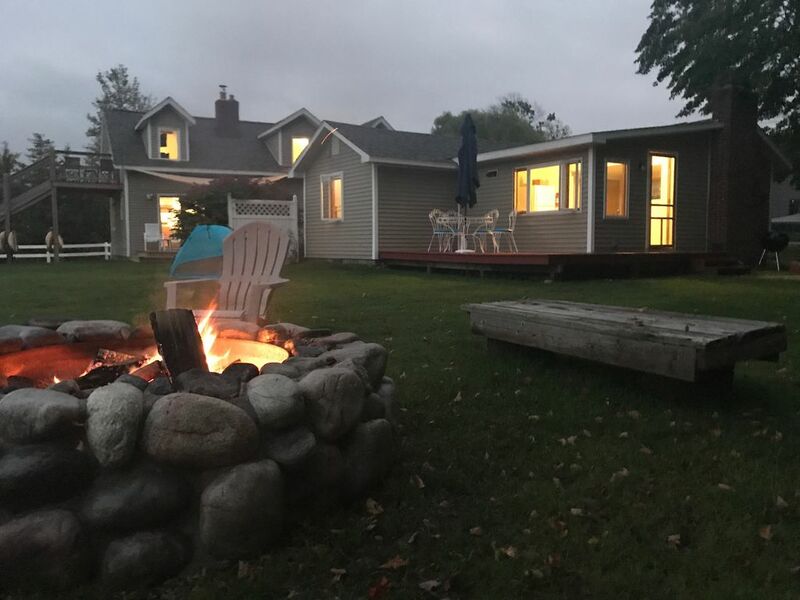 Located in the Village of Lake Leelanau, the Narrows consists of a two bedroom cozy cottage and a main house with a 2 bedroom bungalow and a modern loft that have been completely restored and upgraded. The property offers direct water frontage on the Narrows of Lake Leelanau, Pontoon boat, fishing boat, stand up paddle boards and kayak/canoe rentals. Also available are marine fuel sales, boat slips, a public launch, ice and all our amazing merchandise. The Narrows is within walking distance of all the amenities of the village. Located in the heart of Leelanau County. The Narrows is locally owned, operated by Lake Leelanau residents who have a passion for 5 star customer service. The Narrows offers a unique location between the two main bodies of water of Lake Leelanau. The property is located in the quaint village of Lake Leelanau within walking distance of all local amenities. Including, wine tasting, distillery, local eateries, and grocery store. Walking distance to local grocery, bars, restaurants, wine tasting rooms, a distillery, church and much more. Huge lawn for entertaining, games, etc. Right on the water. Boats welcome/slip fee required. We have a full line up of rental boats here if needed, including two pontoon boats, a fishing boat, a ski boat, a canoe, six kayaks and four SUPs. Life jackets, water skis, tube and fishing gear. My wife and I celebrated our 1 year anniversary at the narrows. The cabin itself was perfect and had everything we needed. The location was great as you can walk to boathouse winery, dicks bar, north peak distillery, grocery store and coffee shop. The fire pit was great and the sky was absolutely gorgeous. Most importantly Hilary was the best host we have ever had and we use vrbo quite often. He gave us awesoem advice and offered to take us places when we didn’t want to drive. He captained us in his boat to dinner at the riverside inn and it made our trip that much more special. He also set up the fire pit for us. He knows everyone in town and can offer great suggestions on where to go. We will definitely be back. Cottage was the perfect size and location for our family. We had everything we needed. Hillary and Darren were always helpful. They even accommodated our boat. I would highly recommend staying here. We had a blast staying here! Cottage was perfect for our needs, clean and comfortable. Walking distance to everything in town, grocery store, restaurants, wineries, distillery and coffee shop. Hilary is great host. Hopefully get out on a pontoon boat next time. Can’t wait to get back up here. Had a wonderful stay, very clean and had everything we needed. Loved that we could rent a pontoon boat right there, super nice guy Darin was great. Loved this area!! I had a great time with my sisters! We loved how quiet it was. We found most things we needed in the kitchen for cooking and dining. Hillary and staff were very helpful. We would definitely like to stay here again! Thanks to the owners and staff, we had the absolute best time on our week vacation! Everyone was so fun, welcoming, and helpful. We liked that it was quiet, but had lots to do also. We rented a pontoon and fished with our litte ones. We plan to come back next year for sure! My son (toddler) left his blankie behind and the owner went above and beyond to find it and ship to us in California! Cant say enough about it! It was clean and beds were comfy too! Thanks again guys! Located between the villages of Leland and Suttons Bay, The Narrows intersects the 17 mile long Lake Leelanau. The Narrows also rent boats, kayaks, has marine fuel and sells ice cream and sundries in the summer season.